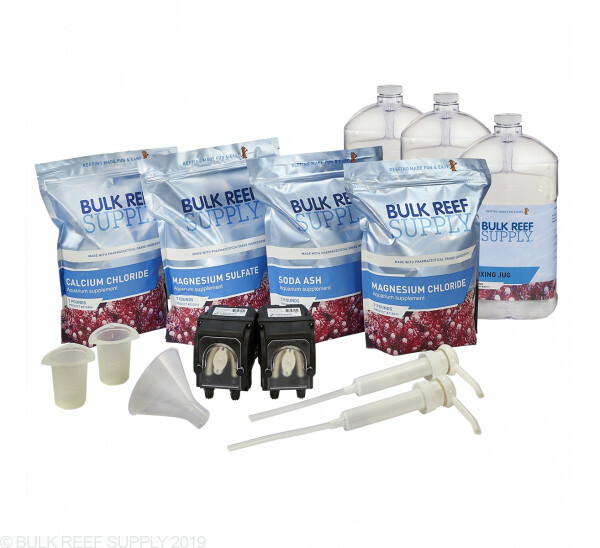 The 2-Part Calcium & Alkalinity Total Package with Dosers include two 1.1mL BRS 2-Part Dosing Pumps that can be combined with any aquarium controller or digital timer for automated and reliable dosing. The pumps will dispense 1.1mL per minute and by drilling a small hole in the cap of the mixing jugs, you can dose the additives directly out of their containers. You can use with cheap timers or a cheap controller and you're all set to start consistently and accurately dose your tank! This kit provides a perfect solution for your 2 part (really 3 part) needs. 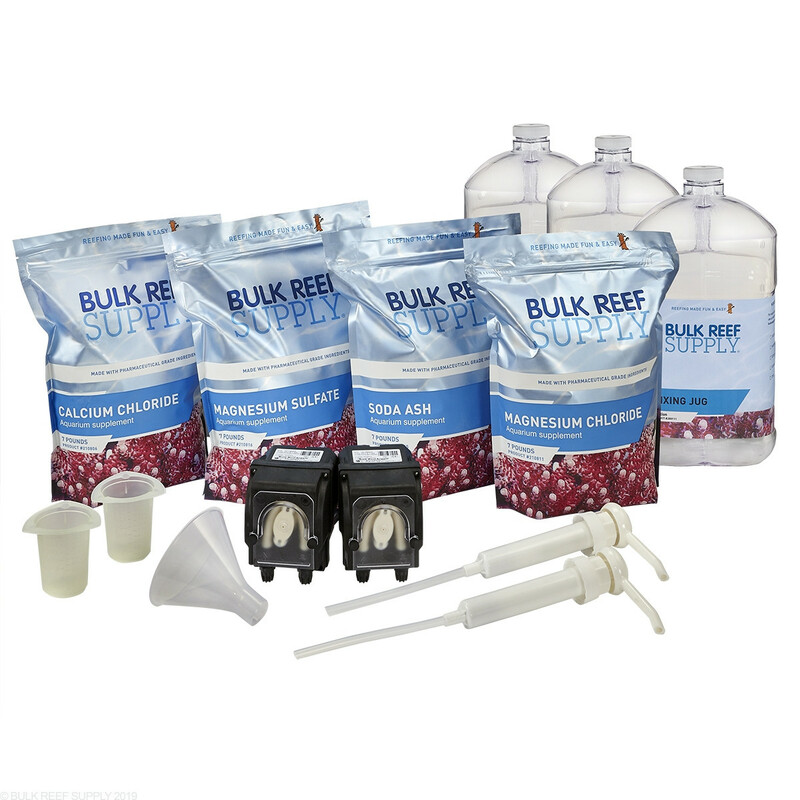 I use a reefkeeper lite basic to control the pumps and it works out just great! Great product comes with everything needed to set up except timers . Easy installation , takes a few days to dial in for your specific needs . I would recommend this to everyone that gets tired of manually adding calcium to your tank. I really appreciate the effort BRS makes to make awesome reef aquariums possible for people without a chemistry degree or unlimited funds! This product has worked flawlessly for me. The directions were simple to follow and with the help of the BRS Reef Calculator and a single BRSTV video, I had my automated 2-part setup dialed in in no time! The dosing motors are very precise, tested my schedule into measuring cups for first week to verify. Right on the money! The two part solutions are easy to work with and package comes with enough to keep me going for long time. Corals doing great! This is a great package and in the long run will save money. The only thing is the dozers in my kit put out a little more than 1.1 ml per minute. I adjusted the timers accordingly and it's all good. No more spilling 2 part dosing by hand. You will like this product. This is my first dosing pump. Very easy to set up and get working, but calibration showed them to be 1.8 and 2.0; not the 1.1 described. Calibrating them before running on the tank is absolutely necessary! Well I waited a long time to get these dosers it should have been the first item to get, a must have item for the reef tank, works well and priced right when on sale thank you BRS. Works amazingly! My corals have been doing great and I feel I have taken the last step to get my tank to support the harder SPS corals. Paired it with the Reef Keeper plus and would never do a tank without this system again. Great deal and super easy to use. Corals really seem to like it. I'm pretty new to dosing and have been really impressed by this package. The dosing pumps were really easy to mount and get set up. BRS did some videos on how to program the apex controller that made setting up the program to time the outlets pretty straight forward. The included instructions and supplies made mixing the different solutions pretty easy. I'm still measuring and adjusting the dose to match what my tanks consumes, but overall I have been really pleased with the results. Getting the dosing pumps calibrated and the system up an running was easy. Very clear instructions and helpful video tutorial. The dosing pumps are quite good, but they are not as precise as pumps I've used in the past... pumps that cost a lot more than those that come with the BRS package. However, they are good enough to have kept my Alkalinity and Calcium rock steady for a month, now. So they provide all the accuracy I need. I would definitely buy this again. I see no reason to spend big bucks on very precise pumps when these do the job perfectly.